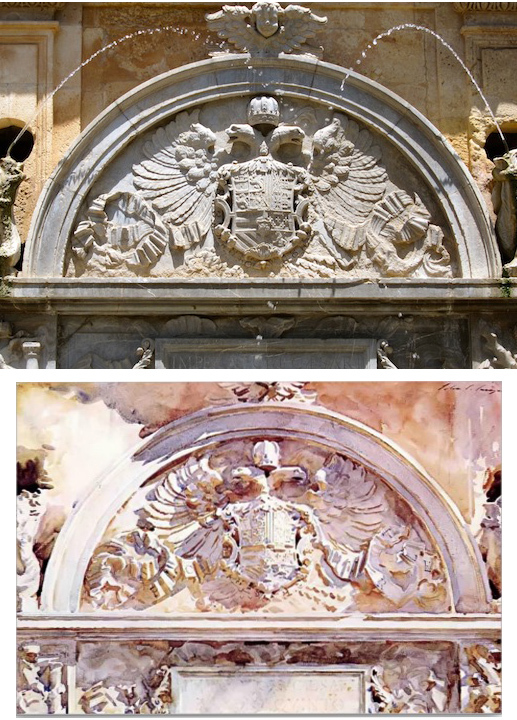 Gurney Journey: Five Lessons from Sargent's "Escutcheon"
part of a sixteenth century fountain at the Alhambra in Granada. 1. Take your time on the drawing. Comparing the painting to a photo of the actual subject Sargent was looking at, it's clear he was very careful and patient with his preliminary drawing. Since the shallow raking light must have lasted a very short time, he might have done the drawing on one day, and painted it on another day, or drawn it in the morning, waiting for the light to be perfect to paint it. For a feeling of brilliance, unify the areas directly lit by sunlight. Limit the range of modeling and tonal value to keep the light areas very light. Instead, put the variation and chroma in the shadows. 3. Keep cast shadow edge dark, cool, and sharp. Note the darkness and coolness of the area of cast shadow right as it turns to light, especially in the upper left of the picture. The step from that cast shadow to the adjacent light should be striking enough to be very noticeable. As long as this value relationship is held at the cast shadow edge, the inner areas of shadow can be considerably lightened. 4. Push the warm and cool variations. Down-facing planes, or planes receiving reflected light from illuminated stonework are warm. Up-facing or open front-facing planes are cool, suggesting that they're receiving mostly blue skylight. 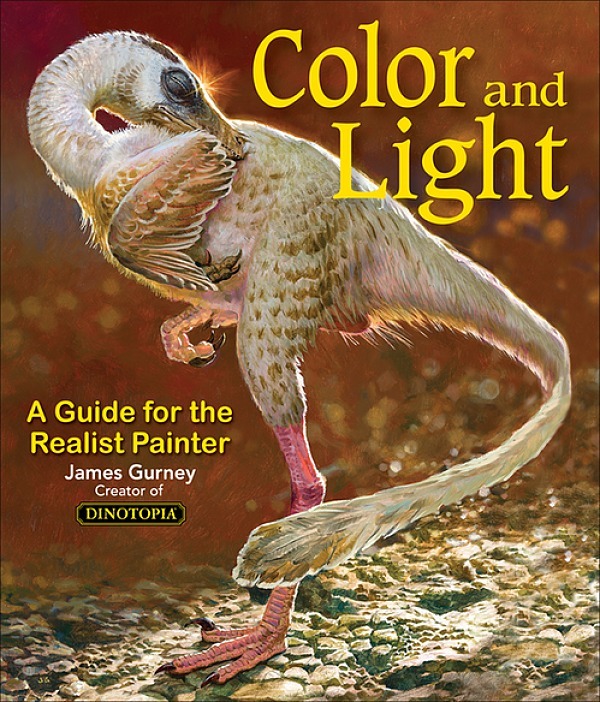 The soft blending between warm and cool requires having pools of each color on the palette and work wet into wet. Watercolor is very fast and ideally suited to such rendering. 5. Put the detail only where you want it. Use the biggest brushes possible but vary the touch. The outer areas are stated very broadly with a big brush. Much smaller touches are used for the details of the coat of arms, and might have been done with a smaller brush. I'd love to hear what you take away from looking at the picture. Date: 1912, Medium: Watercolor and graphite on white wove paper. Dimensions: 12 x 18 in. (30.5 x 45.7 cm) in the collection of the Metropolitan Museum. text seems to be cutoff on the Chrome browser, not sure about others, makes for strange reading. It was also cut off for me, then I refreshed chrome and it came back to normal. The whole painting just oozes light, thanks to the high chroma in the shadows, and those few touches in the cast shadows making it pop right out of the page. Thank you for the analysis; as per your painting at the station, the interplay of warm and cool creates a lot of interest. Thanks for the step by step analysis! 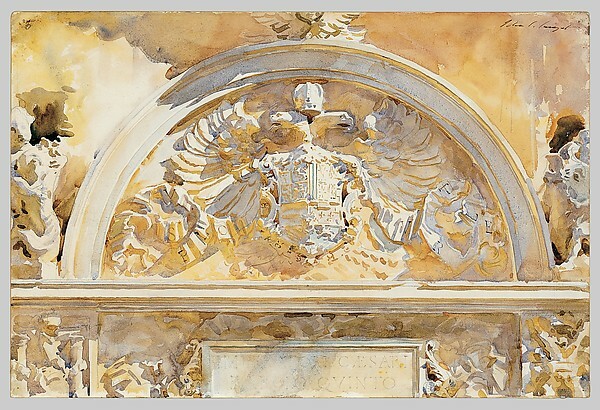 I also like the way Sargent "blew out" the highlight area on the left, breaking the rather stark hemispherical shape of the escutcheon. Makes for a more interesting composition while heightening the sense of brilliant sunlight. Great Post! I appreciate your analysis. I'm amazed at the razor sharp control of values. Painting the shadows at such a high key required perfect pitch control in order to avoid the whole thing crashing into a confusing mashup. And to do it all with watercolor (which to me is a lot harder than oils to control value) in a short time. I like your observation that he probably did the drawing at a previous sitting. James, you totally nailed it with your explanation of JSS's effects. And it transfers to his outdoor work in oils as well. Everything you say here also applies to Sorolla when it comes to representing the intensity of light. Particularly when both artists unify their lights and load the darks with detail. Although both artists often also took advantage of working in a penumbra as well. It's a bit scary to see these side by side since it's such concrete proof of his near superhuman mastery as a draftsman. 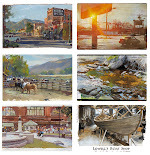 His oil painting are all about paint and brush handling but it is in his drawings and watercolors (and their underdrawings) that we can see his solid drawing chops most clearly. I keep looking at the wings and he didn't fudge the details at all...rather than just indicating wings, he drew the shape and correct number of each, unreal. A careful drawing like that must have taken some time. I wouldn't be surprised if he spent the majority of time on the drawing rather than the actual watercolor step. This is one of my favorite Sargent paintings. Thanks for your analysis and insight. It's an interesting exercise to do such a ambitious painting of such a transitory effect and I think it's because of this that he did an unusually detailed drawing before diving into the actual paint. I love the variation on warm and cool shadows and reflections. Simplifying the very complex subject really pulled it together into a coherent painting. What a terrific lesson! Thank you! Along with Walter above, this is one of my favourite Sargent paintings. I have spent a lot of time looking at this, being baffled as to how this was achieved. I was delighted, therefore, to see your post on how this was achieved. A pity video or timelapse photography wasn't big in Sargent's day. Thanks for the look at some of JSS's techniques. Has anyone else done a study/book on JSS's techniques? Perhaps James, you could do another blog entry on JSS? Marian, funny you should ask. I've been gathering eyewitness accounts of Sargent's techniques of painting, as well as quotes from him and observations of his work, and plan to publish a comprehensive E-book in a year or two. But meanwhile I'll keep the blog posts coming. Recently I've tried painting the shadows first and then after they're good and dry coming back with more or less solid areas of color. It seems to stay nice and crisp when you'd think it would all blur together. Thanks, James. Looking forward to the e-book on JSS. Meanwhile, I'm going to keep buying Richard Ormond's catalog raisonne books. James, you are full of good ideas! Glad to hear there is a Sargent ebook in the future. Really like your comments on JSS. Also, so GLAD to hear that you are working on a book of his techniques. He was such a master and you bringing bits and pieces together for the rest of us - is so helpful. Wow! I was just thinking of doing a study of this painting, and up popped your site! Thanks for the info! !